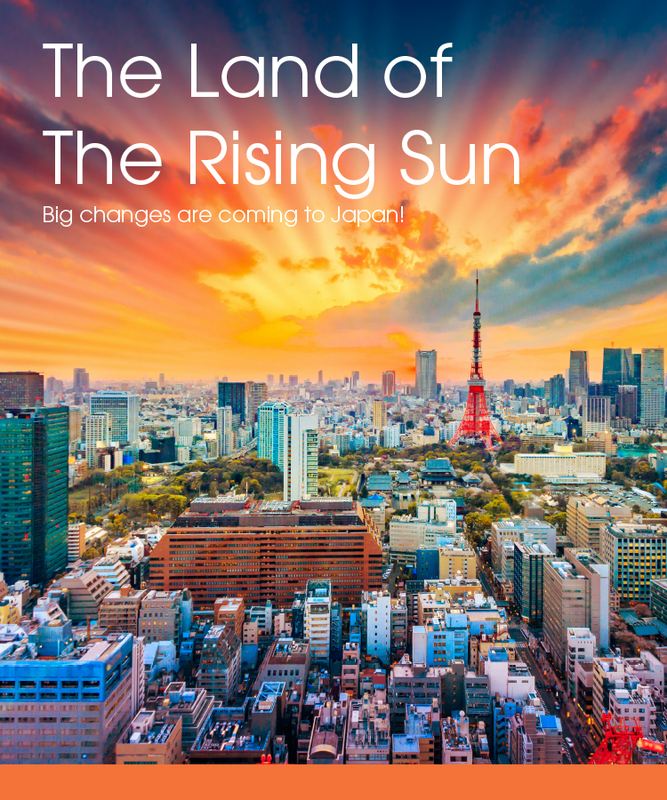 Home » Newsletters » Big Changes are Coming to Japan! Big Changes are Coming to Japan! 2019 will be a big year for events in Japan—and not just trade shows like Security Show-Japan and Textile Tokyo. The World Rugby Cup is coming to 12 venues across Japan, and the whole country is preparing for the 2020 Olympics. New venues are planned for virtually every city–something we’ll talk about next month–so don’t be surprised to find that your 2020 or 2021 shows are in brand new centers. Meanwhile, if your schedule includes a trade show in Japan, now is the time to consider making plans to stay longer for either event because hotels will fill up quickly. Working in Japan? Why not stay longer and attend The World Rugby Cup in 2019 or the Olympics in 2020? A word about spending time in Japan: there are some interesting, if not idiosyncratic, things that we in Japan take for granted—but which you may not know. We thought this would be a good time to give you a primer. While we encourage you to take the train from the airport, if you insist on driving, know that we have blue traffic lights—don’t wait for the light to turn green. It won’t. Japanese trains are the most punctual in the world. Japanese commute on bikes. There are many bike rental options if you want to join the ranks of cyclists to get around in the cities. Most streets in Japan have no names. To give directions people general give landmarks and subway stations. Business include maps on their business cards. Did you forget something? Not to worry. Japan has over 5 million vending machines. You can get anything from underwear to a live lobster. You will find the machines at the convention centers—and near the temple shrines. Out to dinner with a bowl of soba noodles? In Japan, you compliment the chef by slurping. Yes, slurping—this not only signifies your enjoyment but also lets everyone know you are a connoisseur. Let’s talk some more about eating at restaurants: chopsticks should not be crossed on a table or stuck vertically into a bowl of rice. These configurations symbolize funerals and death. Suntory’s Hibiki Whisky won the award for best whiskey in the world. The Japanese love coffee and import 85% of Jamaica’s annual coffee production. If you tip the waitstaff in Japan, you risk being considered rude. Calling at a client’s office in Japan? You may notice some employees are asleep at their desks. They are. Inemuri means employees work so hard that they can nap on the job. One caveat: you must remain upright while asleep. Also, some workers fake Inemuri so that it appears they are working harder than they actually are. Want to stay after the show but you need to check out of your hotel? Consider checking in to one of Japan’s capsule hotels, which originated here in Osaka. You probably have heard about the practice of exchanging gifts with Japanese business associates. What you probably didn’t hear is that you do not open the gift until you are invited to do so. This practice is recent; previously you would never open the gift in the presence of the giver. And whatever you do, don’t rip the wrapping paper; it is considered rude. And finally, if you commit a faux pas like crossing your chopsticks on the table or destroying gift wrap, there are more than 20 ways to apologize in Japan. One of our goals at Idea International is to make your visit to Japan memorable and enjoyable. We encourage you to explore out country and our culture while we handle your trade show needs. We look forward to working with you. Contact us now should you need assistance.